Waste energy usage is essential for the today’s energy crisis in the circumstances where reduction of CO2 and other greenhouse gases is keenly required to ease the effects of global warming. Attention is focused on the waste heat recovery power generation by thermoelectric module, which makes an effective use of waste thermal energy that is presently released into the air. Thermoelectric module is silent and highly reliable because it has no mechanical moving parts. Thanks to these merits it is greatly expected as the key component of waste heat recovery power generation. Toshiba Materials Co., Ltd. applies its specific joining technology to develop high-efficiency and high reliable thermoelectric conversion module based on the innovative high performance thermoelectric material developed by Toshiba R&D center. Advantages and main applications of our module are shown below. 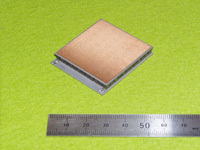 Applying specific joining technology to unique thermoelectric material, our thermoelectric conversion module can be used at an elevated temperature. In case the module is applied to power generation, heating and cooling are changeable only by switching the direction of current. Minute temperature control can be provided in combination with a temperature controller. Our thermoelectric module can be consolidated into a larger scaled module. Hot waste energy usage in manufacturing plants or in automobiles. Equipments and analyzers for semiconductor manufacturing plants because our module can produce precision controlled rapid heating and cooling at high temperature range as compared to conventional thermoelectric modules. Waste heat recovery power generation in manufacturing plants and automobiles. Precision temperature control in semiconductor manufacturing equipments. Our thermoelectric module was included in the entries as the reference exhibit at Thermal Engineering Japan 2007, Techno-Frontier 2007 at Makuhari Messe three days holding from April 18th. *: According to our survey made on April 3rd 2007.